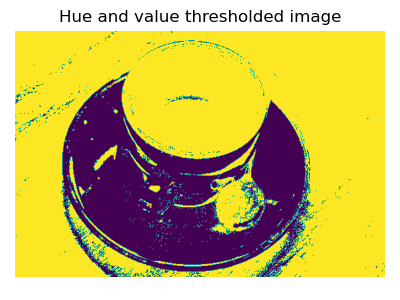 This example illustrates how RGB to HSV (Hue, Saturation, Value) conversion  can be used to facilitate segmentation processes. Usually, objects in images have distinct colors (hues) and luminosities, so that these features can be used to separate different areas of the image. In the RGB representation the hue and the luminosity are expressed as a linear combination of the R,G,B channels, whereas they correspond to single channels of the HSV image (the Hue and the Value channels). A simple segmentation of the image can then be effectively performed by a mere thresholding of the HSV channels.